DeNada Dance Theatre’s latest offering Ham & Passion dishes up a platter of three very different pieces of dance theatre with one key common factor… ham. Well, more specifically, Iberian ham or jamón ibérico. Iberian ham is a cured ham made in Spain and Portugal. However, according to the Spanish Denominación de Origen rules on food products, Iberian ham is only Iberian ham when it is made from black Iberian pigs – or corss-bred pigs that are at least 50% ibérico. Additionally, there are different types of Iberian ham, depending on the pigs. diet and Iberian ancestry. Acorn-fed (jamón ibérico de bellota), pure-bred (puro) Iberian pigs are considered to be the most desirable. The next grade is named jamón ibérico cebo de campo and refers to pigs that are pastured and fed a combination of acorns and grain. Finally, there is also jamón ibérico de cebo, or simply, jamón ibérico. This ham is from pigs that are fed only grain and is cured for 24 months. According to Jamon.com, “the story of Jamón Ibérico ham is steeped in mystery and romance. The ancient oak pastures of Spain, the noble black Ibérico pig, the mountain air which caresses each ham as it magically is transformed into one of the world’s most exquisite foods – all play a part in this uniquely Spanish phenomenon. Without each ingredient the recipe is disturbed. Greatness can only be achieved with patience, skill and adherence to traditional methods”. The ultimate result after an, often lengthy, curing process is a “long, thin leg of ham with a deep golden hue to its fat. The meat is dark red, marbled flavorful fat”. And as an added surprise bonus, Iberian ham is also considered to be a healthy option: “Research shows that the acorns eaten by the iberico pigs are rich sources of oleic acid. It is the same chemical found in olives, and the pigs are often referred to locally as ‘olives with legs’”. 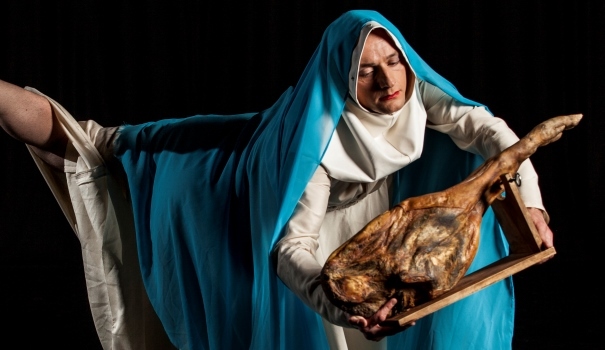 So tuck in and enjoy DeNada Dance Theatre’s Ham & Passion – coming to Bournemouth Thursday 6 April, 7.30pm.